I roll up my sleeve at my prenatal checkup for my routine blood pressure reading and hold my breath a bit, fearing that the reading will be elevated after the shock that was seeing my weight on the scale. "110 over 60, looks great!" the medical assistant announces and I exhale, glad that my blood pressure is staying normal throughout this pregnancy. Because although it may seem like it's one of those things we don't really need to worry about during pregnancy, elevated blood pressure can actually be extremely dangerous. 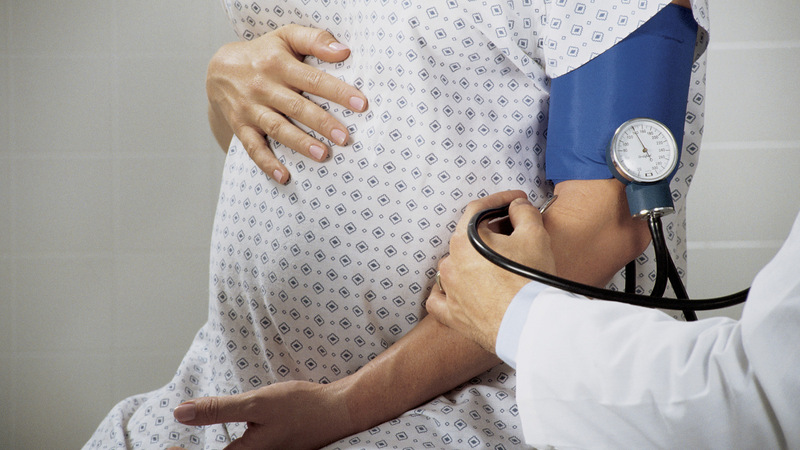 High blood pressure (hypertension) during pregnancy manifests itself in three different ways for childbearing women. 1) Pre-pregnancy or chronic hypertension: This occurs when a woman has high blood pressure before she even becomes pregnant and will most likely struggle with it after her pregnancy as well. 2) Gestational hypertension: Much like gestational diabetes, some women simply develop high blood pressure, without any other major complications, during their pregnancies. There is no one definitive cause or factor, but it just seems to happen in some pregnancies. 3) Preeclampsia: The most severe of the bunch, preeclampsia is a condition that only occurs during pregnancy, is marked by high blood pressure, swelling and protein in the urine and can lead to many complications, including death. The main problem with having high blood pressure during pregnancy is that high blood pressure rarely causes noticeable symptoms until the problem is severe. Luckily, pregnant women are closely monitored during their pregnancies, so your provider will pick up on any elevation in blood pressure right away, but it is possible to develop high blood pressure and not even realize that you have it. Once the high blood pressure becomes severely high, you may notice symptoms such as headaches, vision changes (such as seeing floaters or spots of light) and sudden weight gain. Preeclampsia gets its own section in the high blood pressure discussion simply because it's the most dangerous. Preeclampsia affects between 5 and 8 percent of all pregnancies and is a worldwide leading cause of maternal and infant mortality. It usually strikes after 37 weeks of pregnancy and unfortunately, has no cure except the delivery of the baby. "Preeclampsia is a life-threatening condition, which can possibly lead to liver and kidney failure, and possibly the death of the mom and baby," explains Lisa M. Valle, D.O. and board-certified obstetrician and gynecologist at Plaza Towers OB-GYN in Santa Monica, California. While not all women who go into pregnancy with high blood pressure or develop high blood pressure will necessarily get preeclampsia, they are at more of an increased risk for developing the disorder. High-risk pregnancies, such as multiples, IVF pregnancies or pregnancies in mothers over 35 years old carry more of a risk for preeclampsia. It's also been highlighted more recently in the news, with high-profile celebrities like Kim Kardashian and Adriana Lima battling the disorder. While some high blood pressure disorders, like preeclampsia, can't always be prevented or predicted, there are a few things you can do to protect yourself and your baby from complications due to high blood pressure. Control your pressure now. If you're planning a pregnancy, the best thing you can do is control your blood pressure before you become pregnant. That might mean having a conversation with your provider about ways to naturally lower your blood pressure or starting a pregnancy-safe medication to lower your pressure safely. Get a pre-conception checkup. Make sure everything is in order and that you are doing all you can to ensure your baby's health — right from the start — by checking in with your provider before you start trying for a baby. Know the signs. If you start to develop any dizziness, pain in your upper abdomen or have any sudden swelling, headaches or vision changes, get in to see your provider right away, as these may be signs of complications from high blood pressure and/or the beginning stages of preeclampsia. And, if you've had preeclampsia in the past, know that your chances of getting it again with future pregnancies is as high as 50 to 70 percent, according to Dr. Valle. Consider aspirin. If you've had severe preeclampsia in the past, talk with your provider about using a low dose of aspirin as a daily regimen to help you prevent preeclampsia from occurring in a subsequent pregnancy. The American College of Obstetricians and Gynecologists included a daily 81-milligram dose of baby aspirin in their recent recommendations for treating and preventing preeclampsia.